There's something about tajine dishes that have such a wonderful flavour. I've made tajines with tomato bases and others with olives, herbs and onions. 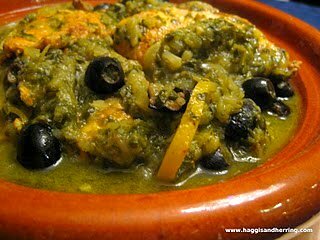 Lemon Chicken Tajine with Olives is the latter, and also the first tajine dish I ever made on my own. This gluten-free Moroccan tajine uses sliced lemons, olives and saffron for a unique flavour that won't be forgotten. 1. Cover the chicken in a mixture of ginger, cumin, paprika, cinnamon, saffron, salt and pepper.2. Brown chicken in a deep pan with olive oil for 2-3 minutes. Remove chicken and set aside.3. Fry onions and garlic for 2-3 minutes. Add parsley and cilantro. Add chicken and stock and bring to a boil.4. Reduce heat to medium and simmer (covered) for 30-45 minutes.5. Remove chicken and set aside, then reduce the remaining sauce for 10 minutes.6. Add lemon and olives and simmer sauce for another 10 minutes.7. Add chicken and simmer for five minutes.Serve with couscous or rice (for gluten-free). This must be my son's all-time favorite dish! Fabulous recipe! Am writing it down now. Pretty much (from my understanding). The ones intended for cooking (as opposed to strictly for serving) aren't painted or finished at all. They need to be soaked so they don't crack, etc. One website I visited said that it could even be used on a stovetop, but I wouldn't risk that. This will take a while but it sounds as if the result will be worth the effort.